On August 5, 1995, Elton Sawyer picked up the 1st last-place finish of his NASCAR Winston Cup career in the Brickyard 400 at the Indianapolis Motor Speedway when his #27 Hooters Ford dropped a valve after he completed 17 of 160 laps. The finish came in Sawyer’s ninth series start. Born in Chesapeake, Virginia, the same hometown as NASCAR legend Ricky Rudd, Sawyer was for much of his career a fixture in what is now the NASCAR XFINITY Series. He made his series debut on October 30, 1983 in the season finale at Martinsville. Driving for veteran owner-driver Emanuel Zervakis, Sawyer qualified his Pontiac 18th in the field of 42, then finished 30th after a crash. The following February, Sawyer fielded his own car, a #02 Pontiac, and in his second career start finished a strong 7th. Though he’d make just five of 29 races that year, he finished 9th or better in all five, including a runner-up in his return to the Martinsville finale. 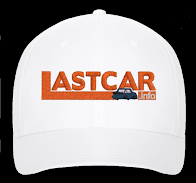 Driving for Bill Lewis, who like Rick Hendrick went from car dealer to car owner, Sawyer came just two carlengths from beating Cup newcomer Morgan Shepherd. Sawyer and Lewis steadily developed their program into a full-time effort in 1987, when they ranked 14th in the season standings. That June, the duo seemed primed for their first victory at the Indianapolis Raceway Park. With 18 laps to go, Sawyer took the lead from Don Kreitz, Jr. and was out front on the final lap when a lapped car got in his way, handing the victory to Larry Pearson. Driver and owner would come no closer through the 1989 season, when the two parted ways. In 1990, Sawyer signed with Alan Dillard, Jr., who would go on to field Ward Burton’s first Cup Series ride four seasons later. This time, Sawyer acquired sponsorship from Chisholm Boots and Gwaltney Foods, and would also be teamed with another rising star – fellow Virginian short tracker Rick Mast. Mast had scored two wins a season for the previous three years, and would rack up another three in 1990, yielding 10th in the season standings. Sawyer remained just 13th in the standings with another pair of runner-up finishes, both to Tommy Houston. On November 24 of that year, Sawyer married fellow racer Patty Moise, who would run a few races for Dillard the following season. The Jacksonville, Florida driver had by then raced in Busch since 1986 and had also made five Cup starts at Daytona, Talladega, and Watkins Glen with a best finish of 26th in the 1988 Firecracker 400. Sawyer, however, had yet to make the move to the elite division, and would lose his ride with Dillard midway through the 1991 season. By the end of that season, Sawyer had made 164 starts without a win. He’d have to make another 16 before it finally happened. That day came on June 11, 1994, during the Carolina Pride / Budweiser 200 at the Myrtle Beach Speedway. Sawyer was now driving for Sutton Racing (later Akins-Sutton Motorsports, then Akins Motorsports), a team co-owned by Bob Sutton and Brad Akins. After a two-race schedule in ’93 were now attempting the full ’94 season with sponsorship from Ford Motor Credit. After a hot-and-cold start to the season, including a DNQ at Atlanta where the team had to buy a ride from car owner Ron Zock, Sawyer qualified 4th at Myrtle Beach, took the lead from Kenny Wallace with 20 laps to go, and cruised to victory by more than two seconds. Not long after, his opportunity finally came. Since 1953, Junior Johnson had fielded some of the fastest cars in the Cup Series garage. On top of his own legendary driving career, he’d fielded rides for the likes of Fred Lorenzen, A.J. Foyt, and Curtis Turner. He’d won championships with Cale Yarborough and Darrell Waltrip, and nearly scored the ’92 crown with Bill Elliott. The last three of his 132 Cup wins had come the year before - two with Jimmy Spencer and a ninth Darlington victory with Elliott. But in 1995, Elliott and Spencer were gone, and so were their sponsors. In Elliott’s place came Brett Bodine, who a year later would buy the team and become an owner-driver for the next eight seasons. Spencer’s #27 went to Loy Allen, Jr.
Allen, the previous year’s Daytona 500 polesitter, brought with him sponsorship from Hooters Restaurants, which had backed his efforts since his days in ARCA. Unfortunately, Allen’s three poles that season turned out to be the only highlights of a forgettable season. 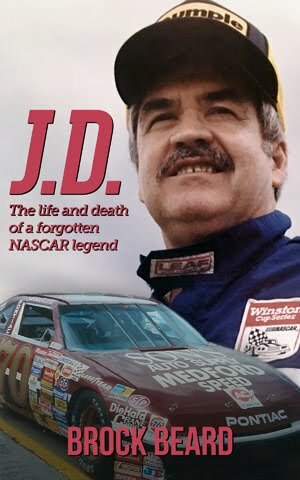 He made just 19 of 31 races, failing to qualify 12 times, including the inaugural Brickyard 400. At season’s end, Allen and Hooters took their business to Junior Johnson’s team. In early 1995, the results weren’t much better. Without the Hoosier tires that aided his pole runs, Allen started 37th in the Daytona 500, finished no better than 17th, and failed to make the fields at Atlanta and Bristol. By late April, it was clear a change had to be made. It was the perfect opportunity for Sawyer. 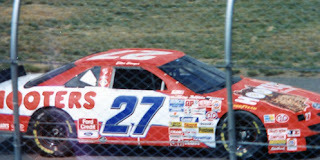 Through these first months of the ’95 season, the plan had been for Sutton and Akins to move their program from Busch to Cup, giving Sawyer a chance at Rookie of the Year in 1996. But when the opportunity to drive for Junior Johnson arrived, he took it, forsaking a ROTY run by competing in 20 of the remaining 23 races. His first Cup start would come at the very scene of his Busch debut a whole 12 years earlier – the Martinsville Speedway. Sawyer put up the 9th-fastest lap in qualifying – more than enough to bump seven drivers from the field – and finished 20th in the rain-shortened event. After one-offs at Pocono where the #27 was driven by Jimmy Horton, Greg Sacks, and Jeff Purvis, then a DNQ at Sonoma, Sawyer responded with a season-best 14th at Talladega. Next up was Indianapolis, not far from the scene of his near-victory in 1987. The second annual Brickyard 400 had far fewer entrants than the inaugural – just 50 drivers for 41 spots. While Sawyer managed to secure a spot in the field, he struggled to find speed, putting up a speed of just 167.592mph, nearly two seconds off the pole speed set by Jeff Gordon. The lap required Sawyer to use a provisional to make the field, placing him in the final starting spot. Things looked better on the Busch side as Sawyer won the pole at Indianapolis Raceway Park for Friday’s Kroger 200, led 51 laps, and finished just under 1.5 seconds behind race winner Jason Keller. The run jumped Sawyer from 12th to 9th in the series standings. With the start delayed several hours because of rain, the 41 engines were fired from Gasoline Alley for a mid-afternoon start. At the start, Sawyer tried to make a move to the inside, then was gapped by the field as the leaders headed into Turn 1. By the end of Lap 10, he had completely lost the pack and was being caught by Jeff Gordon down the front straightaway, the flagman signaling him with the “move over” flag. Sawyer moved aside in Turn 3, then was drafted by the pursuing pack down the frontstretch, his engine sounding flat. Seconds later, Rick Mast nearly collided with him into Turn 3 as Mast tried to pass Joe Nemechek. On Lap 15, Sawyer came off pit road, the crew believing the issue to be an ignition problem, but the engine stayed sour. 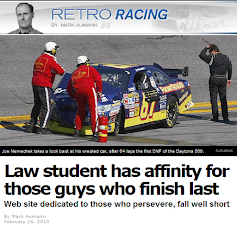 He was four laps down on the 20th circuit as he slowed down the frontstretch. Soon after, he pulled behind the wall. Sawyer said the team hoped to come back out, but when it was diagnosed as a dropped valve, he was done for the day. It was Junior Johnson’s second-straight last-place finish in the Brickyard 400, following Jimmy Spencer’s hard crash in the #27 during the ’94 inaugural. With darkness fast approaching, the race ran at a torrid pace with just one caution slowing the action, preventing a race shortened by darkness. The only other two DNFs that afternoon were both due to engine failures in the second half of the race. 40th went to Derrike Cope, whose #12 Straight Arrow Ford blew on Lap 104, and Bobby Hillin, Jr. in the #77 Jasper / USAir Ford. Rounding out the Bottom Five were two drivers who played a significant role in the race’s outcome. The lone caution that slowed the day’s action came out on Lap 133 when 38th-place finisher Jeff Burton crashed his #8 Raybestos Brakes Ford the backstretch, nearly collecting Rusty Wallace. Wallace, who was trying to catch race leader Dale Earnhardt, had moments before been crowded at the exit of pit road by 37th-place finisher Rich Bickle in the #40 Kendall Pontiac, causing him to lose even more ground during the green-flag stop. The late restart gave Wallace another chance at Earnhardt, but he ended up with his first of three runner-up finishes in the event. Indianapolis began a difficult stretch for driver and team as Sawyer failed to finish six of his 11 remaining starts, and he missed the cut again at Bristol. In 1996, when the #27 team was sold to David Blair, Hooters Restaurants left to sponsor Rick Mast’s #1 Pontiac for car owner Richard Jackson. Despite once again facing a lack of sponsorship, Sawyer managed to earn the outside-pole for the final spring race at North Wilkesboro, but finished no better than 19th. Sawyer lost his ride at midseason, then drove one final race in the Atlanta finale, driving a car Harry Ranier had originally prepared for Tony Stewart. In just 29 Cup starts, he finished last four times. The Sutton-Akins-Sawyer Cup Series effort never came to pass (though Sutton would field Boris Said’s Cup entry in 2005), and Sawyer picked up where he left off in the Busch Series in 1997. With new sponsorship from Barbasol Shaving Cream, Sawyer secured 8th in the season standings, a new career-best. The effort was buoyed by a gutsy performance at Las Vegas, where he suffered first and second-degree burns in an early crash, climbed back in the car, and salvaged a 31st-place finish. He then ranked 5th in the standings for the next two years, during which time he earned his second and final series win at Loudon on May 8, 1999. Sawyer made his 392nd and final Busch Series start on November 16, 2002 at Homestead, where he ran 22nd for Brewco Motorsports. 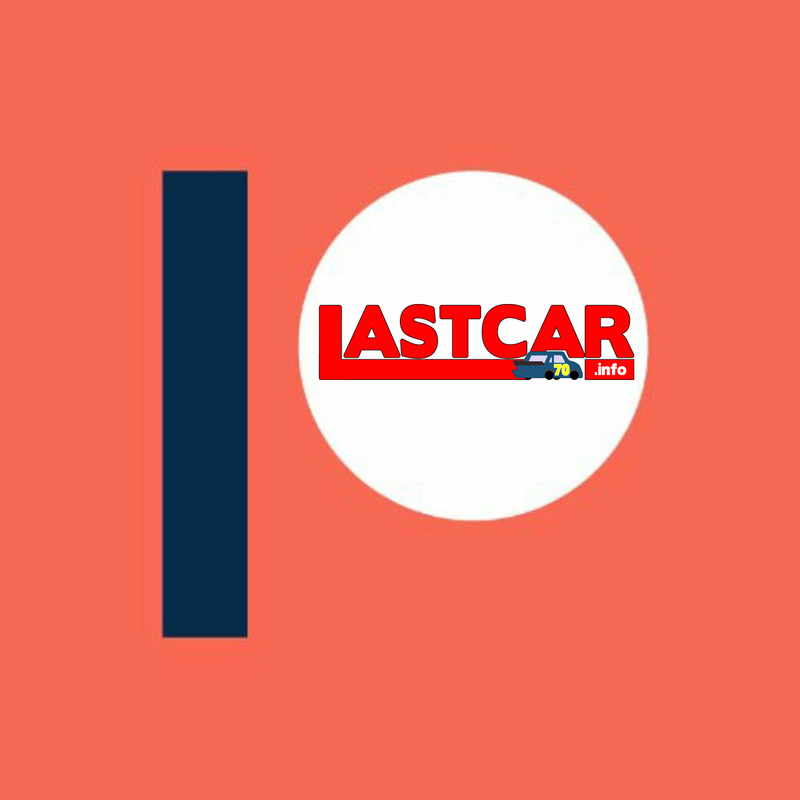 He then turned his attention to officiating, first as the Director of Team Operations for Action Express Racing in the Tudor United SportsCar Championship, then in NASCAR as its Managing Director of the Camping World Truck Series. He was last year promoted to NASCAR’s Vice President of Officiating and Technical Inspection, where one of his first cases was Derrike Cope’s bizarre explosion at Watkins Glen. *As of this writing, Sawyer remains the only driver to earn his first career Cup Series last-place finish in the Brickyard 400. The #27 has not finished last at the track since, and would in 2011 go to victory lane with Paul Menard and Richard Childress Racing. *Albert, Zack. “Cope on Car Issues: I’ve never ‘seen that transpire before,’” NASCAR.com, August 7, 2016. *FOX Sports. “NASCAR moves Chad Little to inspection role; Elton Sawyer to lead Truck Series,” FOX Sports, February 2, 2015. *nascarman, “Historical Motorsports Stories: Tony Stewart’s Planned Cup Debut,” November 17, 2016. *Staff report. “NASCAR Enhances Competition Executive Team,” NASCAR.com, July 12, 2016. *Pearce, Al. “Drive to Do Double Duty: Sawyer To Run Cup, Grand National Races,” Daily Press, May 17, 1995.